Touring by bicycle in Zurich, Switzerland. By nik.clayton. The morning coffee run just got easier. 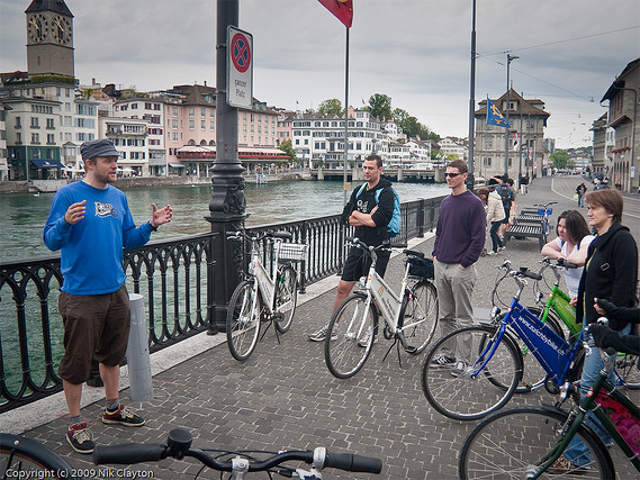 With many cities around the world seeking to become more bicycle-friendly, Zurich, Switzerland has just taken it to the next level. At the Rathaus Cafe, overlooking the Limmat River in Zurich, cyclists commuting to work can have their coffee, breakfast, and morning paper without even hopping off their bicycle. Known as the VeloKafi, two specially designed outdoor terrace tables serve a dual function as docking stations to accommodate the front wheel of a bicycle and allow guests to rest their feet on raised platforms on either side. This innovative project is part of a larger campaign, called Stadtverkehr 2025 [“Urban Transport 2025”], launched in 2012 by the city of Zurich and aimed at strengthening the city’s non-motorized transport culture, and in particular, promoting cycling, pedestrian access, and people-centered urban space projects. As part of the citywide campaign, the two pilot stations will reportedly be moving to different locations throughout Zurich in the coming months. The US state of California has even asked for the bike-friendly blueprints.